The Brazilian tradition that's sweeping through American dance. About halfway through a beginner capoeira class at the Ailey Extension, students pair off to put the movements they’ve been developing into practice. The instructor, Tiba Vieira, lightly pounds a tall, wooden drum to keep the time. Facing one another, the men and women rock back and forth low to the ground until one executes a surprise roundhouse kick, forcing the other to lunge and duck or spin across the floor. “You’re gonna get a free haircut,” Vieira quips after one student just barely clears his partner’s sweeping leg. Capoeira is a Brazilian martial art dating back to the 16th century, when it’s believed African slaves began disguising their self-defense training as a dance. “We say we dance like a fight and fight like a dance,” says Vieira, who’s been teaching and performing the style for almost two decades. 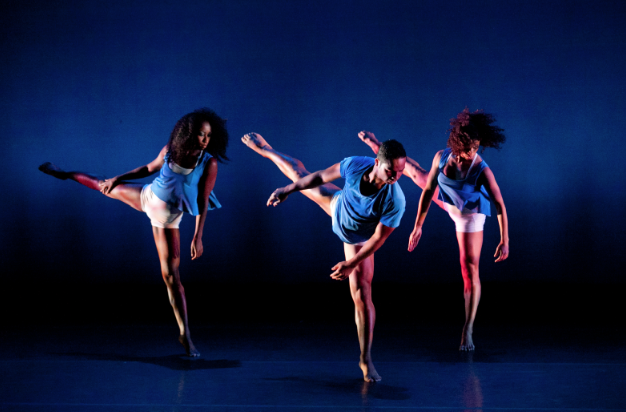 “The movement requires you to be strong and tough, but delicate at the same time.” That unique combination has attracted the attention of the modern dance world in recent years. 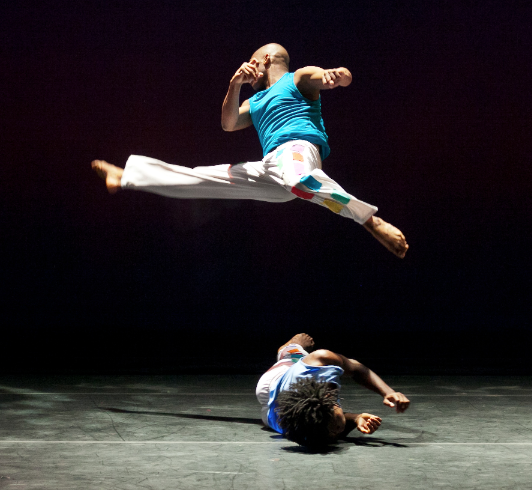 Choreographers like Ronald K. Brown and Larry Keigwin have infused their work with hints of capoeira, and dancers have discovered the benefits of studying the form. A typical class begins with a warm-up followed by a succession of elements of simulated combat, starting with the ginga, a foundational swinging movement. (See sidebar.) From there the students learn various kicks and strikes as well as defensive moves like dodges and rolls to react to their partner’s attacks. At advanced levels cartwheels, flips, and other tricks are added to the mix. 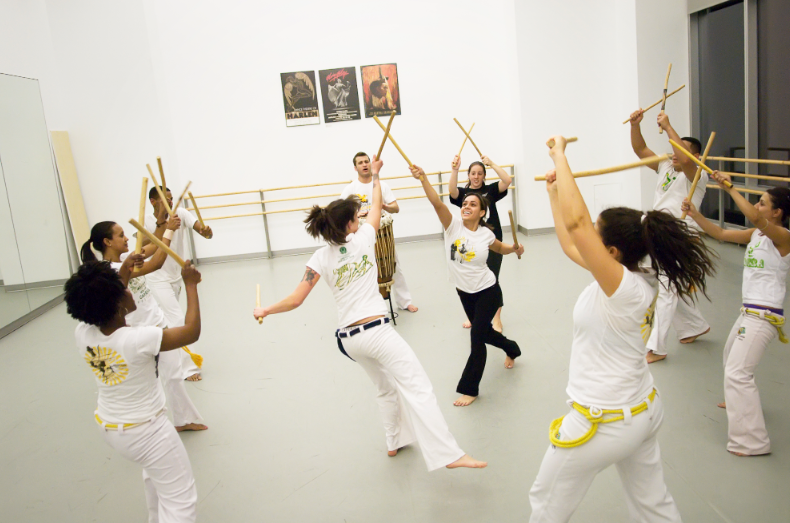 Many dance studios have added capoeira to their roster. Here are a few terms you might hear in class. Ginga: “The soul of capoeira,” as instructor Tiba Vieira puts it; all other moves are built upon its rocking motion. A low, swooping side step (from a wide fourth on one side to a wide fourth on the other) with torso opposition, the ginga’s purpose is to ground the body and prepare it for more elaborate movements. Atabaque: A large Afro-Brazilian hand drum, traditionally made of Jacaranda wood and calfskin, that’s often used by instructors to establish rhythms and lead songs. Most classes don’t have independent accompanists; capoeiristas are expected to play the indigenous instruments—like the atabaque, berimbau, pandeiro, and caxixi—as part of the form.